The Legacy 650 has truly redefined the super midsize category with its incredible range, comfort and productivity. As an extended-range version of the legacy 600, the jet offers the same spacious three-zone cabin, but with better fuel efficiency through structural and technological modifications. Starbase Jet, a leading private jet services provider, continues to grow its fleet with the recent addition of a Legacy 650 – the first available for charter in the US - based out of Moline, Illinois. The Legacy 650 has truly redefined the large jet category with its incredible range, comfort and productivity. As an extended-range version of the legacy 600, the jet offers the same spacious three-zone cabin, but with better fuel efficiency through structural and technological modifications. Embraer’s Legacy 650 increased performance is a result of enhanced aerodynamics and the new Rolls Royce AE 3007A2 engines, enabling the 650 to have lower fuel consumption than its predecessor, while producing 12% more power. With a normal cruising speed of Mach 0.78 (high speed of Mach 0.80), an operating ceiling of 41,000ft and its 3,900 nautical mile range, transatlantic missions are carried out with ease, connecting New York to London and Chicago with Lima. Accommodating up to 13 passengers, the 650 has the largest cabin – with three truly separate zones - the largest galley and the largest lavatory in its class. A fully accessible inflight baggage compartment with 240 cubic feet, and interior storage capacity of 46 cubic feet allows for travel in absolute comfort. The 1,650 cubic feet of living space has 22 large well-distributed windows allowing for plenty natural lighting. The interior is composed of clubs seats and sofas, which convert into 6 sleeping positions for long distance flights. Equipped with Honeywell Ovation Select Cabin Management System, showcasing a full HD video system, high definition media input, cabin WiFi, blu ray players, XM radio, full HD LCD 32” monitors, and individual monitors. The Swift Broadband high-speed data connection with up to 432kbps transfer rate, inflight phone system with worldwide coverage and a conference table area all provide the perfect environment for both en route productivity and outstanding inflight entertainment. With the addition of this new Legacy 650, the total number of aircraft in the Starbase Jet fleet that are available for private charter is now 25. In addition to aircraft charter, Starbase Jet also specializes in aircraft sales and acquisitions, aircraft management and aircraft maintenance services. To learn more about Starbase Jet or to book a charter at competitive rates visit http://www.starbasejet.com or call 877-837-5387. Starbase Jet is an industry-leading private jet service provider, specializing in worldwide jet charter, jet card programs, aircraft management, aircraft sales and acquisitions and aircraft maintenance. Backed by an $800 million company, Starbase Jet has been providing leadership and value to private jet travelers for more than a decade. With over 30 aircraft under management, across 19 aircraft types, the company delivers unparalleled standards in service, flexibility and value by designing bespoke solutions to accomplish each individual customer’s private jet needs. Starbase Jet’ operations are classified with the prestigious ARGUS International Platinum Rating - an accreditation earned by only 5% of jet charter operators. The company is headquartered in Houston, TX with additional facilities across the USA and abroad, including Dallas, Austin, San Antonio, Los Angeles, Santa Ana, and Singapore. 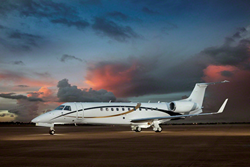 For news and information visit http://www.StarbaseJet.com or to book a charter contact Sales(at)StarbaseJet(dot)com.